Gluten allergies and gluten intolerance are the new age health afflictions. Gluten free is the new health tag on packaged products which is misleading most of the times as the product comes loaded with other anti-nutrients or harmful chemical additives. It is very important to understand gluten and its afflictions so we know whether gluten is bad for everyone or only some people are allergic or intolerant to it. It is also worth knowing the gluten free options available and whether those are good for everyone or for only gluten intolerant folks. I have been getting many questions regarding the use of millets in my recipes most of the times. Some readers ask if gluten is bad for us and how and why to refrain from gluten in our daily food intake. Do millets give a dependable solution? Millets in the form of multi grain breads and flat breads have been in my diet for ever and on this blog since it's conception. All my multi grain soups and khichdi recipes here have them, the pearl barley being my all time favorite and finds it's way into my pasta style meals and soups regularly. They really are a solution for me, someone who likes her chapatis and breads. Interestingly, my choice for millets does not come from the fear of gluten as I am not allergic to it. The inclusion of millets in my overall meals is a conscious choice in order to include more micro nutrients from different sources and ensuring high fiber complex carbohydrates. Gluten has not been my monster being brought up in a household where chapatis and parathas were a normal way of everyday food. We had our daily bread, grew well and all of us siblings have been doing well health wise. Am I claiming gluten is good? Wait , I have something more to say. Firstly, it was not all gluten that we had. We had a lot of green vegetables on a daily basis, lots of proteins from lentils and fish and meat and there was no store bought bread on our tables. Not even biscuits. No aerated drinks and no packets of chips and savories. Most of the stuff was freshly procured and homemade. Now when I look back. I know where are the roots of my healthy eating habits. Gluten was minuscule compared to other food groups. Habits are mostly independent of knowledge. Knowledge made me more aware but it was an easy choice for me as I was brought up that way. Now if we see around, all the people who were eating store bought breads and even biscuits in those times, say a couple of decades back, were not sensitive to gluten apparently. Or not all the blame was stamped on gluten alone. Gluten allergies were very rare and mostly unheard. We would analyse the things which changed during these two decades or so. It has happened in India and most definitely all around the world as we get to read things about nutrition and gluten sensitivity all the time. I would suggest you to recall the breads we used to get in those days. Were the breads this soft as they come now? Did those breads last this long even when stored in the fridge. Better preservatives I say, It's a long time I have seen a mouldy bread, or may be because I have stopped buying breads. Also, were there as many biscuits and cookies being sold and consumed? Each one claiming to be better than the other, they all use additives to make them suitable for sitting pretty on the shelves for about an year. Even the whole wheat and multi grain breads are so soft these days you wonder how do they do it. You would know what I am talking about if you have baked bread at home. There is added gluten in the bread dough made industrially and it would be a horror to know that added gluten is treated with Formaldehyde which is a potent carcinogenic. All the dough conditioners and caramel coloring makes it worse. Check out here how the humble looking bread can carry a lot of unwanted stuff . Clearly, all those additives with the gluten containing food is making it worse. And more and more dependence on bread, bagels, biscuits, cakes and pastries is adding to it. Fast food and junk food is all loaded with gluten and wheat as it is a cheaper ingredient and gives good color, texture and taste when added with cheaper conditioners, emulsifiers and trans fats. All the baddies have come together in those attractively packaged, cleverly marketed, readily available food on the go. No wonder. It would be better to know why gluten is a baddie for many of us. Yes, even when we are not allergic or intolerant to it. Gluten is still inflammatory to each one of us. The extent of it's inflammatory nature depends upon how much gluten we consume and in what food combinations. In the company of preservatives, conditioners, emulsifiers it becomes worse with it's antics. The inflammatory impact of gluten is seen in people prone to chronic pains, Fibromyalgia, Heart disease, Multiple sclerosis. Macular degeneration, Diabetes and as common a problem as Gout and Arthritis. Gluten would make the pain and inflammation worse. It is relieving to know, eliminating gluten in many of these situations (as much as I have seen in my clients) helps in pain and inflammation management. 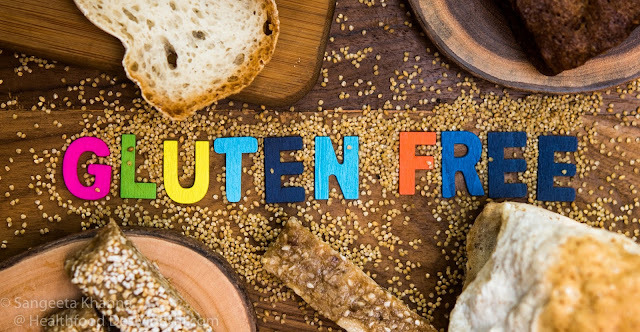 Reintroducing gluten, in a way when the person is tempted to eat a pastry or bread some days, brings back the pain in many chronic pain sufferers. So the implications are clearly marked. One more very interesting aspect about Gluten is, that it has a molecular structure similar to the cartilage in joints. So when someone has an Autoimmune condition and has an allergic reaction to gluten, the body would react to eliminate gluten as a foreign invader and at the same time it would attack it's own cartilage cells too. Here it becomes more complicated. Be aware if you have an autoimmune problem. If you have Celiac condition, gluten is worse for you and this is not something new for you. Following an anti inflammatory diet is great for you which includes a lot of Omega--fatty acids from fish or from loads of flax seeds every day. This kind of anti inflammatory diet can be good for each one of us as Gluten is an antinutrient which hampers the absorption of nutrients by the intestinal walls. The good news is you can easily drop the gluten from your diet and use alternative flours for your daily bread and even cakes when you want to eat some. The world is still full of so many tasty yummy foods as nature has been bountiful. Why being blind or just to have an eye for flour,sugar and butter combinations. Also, you can easily detox yourself from the bad effects of gluten caused already in your body. Increased amount of Histamines, chronic elevation of Cortisol to fight all the histamines as well as the inflammation are some of the bad impacts of gluten sensitivity your body would want to get relieved from. It really leads to adrenal fatigue. Natural whole food high on some anti inflammatory ingredients would make you easily kick off all the bad impacts of gluten. Gluten detoxing can help you getting relief from symptoms of Fibromyalgia . Please do not get scared by all the inflammation Gluten can inflict on your system. If you have been eating controlled amounts of wheat, overall smaller portions of carbs that have a good range of mixed grains and tubers, there is no need to worry. We normally eat enough nutrients and enough anti inflammatory food and antioxidants too in a balanced diet that a little amount of gluten initiated inflammation can be taken care of. But that happens only if the gluten consumption is in safe limits. If your plate loads up more vegetables, lesser proteins and fats and even lesser carbohydrates, there is no worry about how the gluten would be metabolised. But if you do not count your chapatis and pastries and cakes during the day and all you eat is just breads and cakes and some more biscuits and crackers through the day, it's high time you analyse the reasons behind your pains and aches that bother you every day and the low energy level which makes you cranky. Yes, I know you have all this IF.....you are loading your plate with gluten enhanced breads and biscuits, cakes, pastries and no vegetables and fruits. Having said that, I personally do not worry much about gluten loaded food once in a while. Say if I have to eat a chocolate cake somewhere in a gathering, I would like to enjoy it and may be I would have a Naan bread in the same meal too. But an overdose of gluten in one meal will definitely be countered in the next meal or the next day's detox meals. Being a little free while enjoying social gatherings and stricter when eating alone works fine with most of us. On a day to day basis all my breads would have either alternative millet flours added to them, made moslty using sourdough or some greens pureed and added to make my parathas. My cakes would be made using millets many times. Do you mind your gluten intake? I am contributing to a wonderful blog called The Purple Pact which talks about awareness and possible cures for Fibromyalgia, Chronic pain, Pins and needles and Spine degeneration. All these ailments are interlinked to each other and some lifestyle changes can make the symptoms under control it seems. Gluten eliminations seems to be an effective way to manage the symptoms. Please let me know if you find this article helpful for you. Thank you. Is gluten a monster for all? Who should avoid gluten and why? Welcome to my blog and glad you liked it. Hi Sangeeta! this is so well written and lucidly explained without jargon and straight to the point. This Gluten question was very frequent from my mail subscribers, I hope all common queries have been answered. So beautifully explained. i will have to read it again so am favouriting it. I am glad it would prove helpful. Awareness is a tool we use to make our habits better each day. Isn't it? very informative post dear .. Lately it has been a real buzz for Gluten free recipis all around. this should give a nice stir among them..
As all other fads, gluten free is also quite overrated. Everyone doesn't need to stay away and yet everyone needs to know what is the limit. Excellent write up! I have been planning to write a post on why I have chosen to eliminate gluten in my food. I found this very useful.